My Very First Blog: Can Lightning Strike The Same Place Or Person Twice? Can Lightning Strike The Same Place Or Person Twice? OK, here's another one of my post on lightning again. What inspired me to blog about lightning? Well, the other day I was about to leave my house for an appointment in Bangsar when it suddenly rained heavily complete with thunder and lightning. The lightning was really scary, I tell you. I could see thick flashes of lightning very near my house and I was worried about running out to my car which was parked beside the road outside my house. I was thinking, should I risk my life dashing out of the house and into my car? Maybe I should just cancel the appointment. Which was more important - the appointment or my life? Guess what? I chose the appointment! Haha! What is living without some risk taking, yes? But it must be a calculated risk, of course. How did I weigh my risk? Well, I figured the safest time to dash out to my car was right after I see a flash of lightning. Because the chances of a second lightning strike would be minimal right after the first one! Anyway, I got myself ready. The moment a huge lightning flashed in front of my house, I made a quick dash to my car, so quick, I think I could have beaten Olympic champion Jamaican sprinter Usain Bolt! Once inside the car, I quickly closed the door and heaved a sigh of relief. If you don't already know, the car is one of the safest place to be in a thunderstorm. Maybe some of you are thinking I was over-reacting. Well, if you think so, you probably do not know the dangers of lightning. Are you aware that the probability of being struck by lightning in Malaysia is higher than winning the lottery? But what is the probability of lightning striking the same place or same spot twice? This is, in fact my topic for today's post. Nil? Zero? Well, if you think lightning never strikes the same place twice, think again! It has been reported that the Empire States Building in New York gets struck by lightning on the average of 100 times a year. I wonder how many times our Petronas Twin Towers in KLCC gets struck by lightning in a year? The video above did not really show the lightning hitting the Petronas Twin Towers in my opinion. But this video below showed the lightning really hitting the KL Tower! Even the back of my house was struck by lightning many times in a year, and sometimes twice within minutes in the same storm! Storm observers will definitely tell you it's a myth that lightning never strikes the same place twice. So if you know a certain place has been struck by lightning before, do be cautious and try not to go there when the next storm occurs! 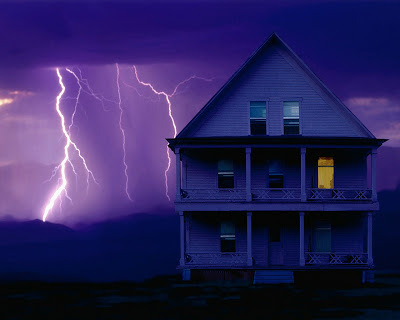 If you want to know how to protect yourself from lightning, read one of my previous posts here. Lightning, despite being a dangerous natural phenomenon, is really a fascinating subject. I have always love the rain, and it's not too absurd to tell you that I love lightning as well. Provided I'm in a safe place of course. If you are avid photographer, I hope you will take some good lightning photos and send to me! You may think I'm weird, but I actually love collecting lightning photos! Now that you know lightning can strike the same place more than once, how about lightning striking the same person twice? Is that even possible? I had a good laugh during the movie, but on searching about survivors of lightning strikes online, I was amazed to find that there is in fact, a person in real life who was really struck by lightning 7 times! His name is Roy Sullivan. You can read about it here. Since we are on the subject of lightning, do you know that you can calculate how far the lightning is from you? We all know that light travels much faster than sound. So expect to see the lightning first before you hear the thunder. What you do is calculate the time taken for you to hear the thunder after you see the lightning. Then divide the number of seconds by 5 to calculate the distance in miles or by 3 to calculate distance in kilometres. For example, if you counted that it took 6 seconds between seeing the lightning and hearing the thunder, then the lightning is 2 kilometres away from you. Pretty easy, isn't it? But that doesn't mean that if you calculated that the lightning is 10 kilometres away, you are safe. The reason is, lightning can strike within 16 kilometres or about 10 miles from a storm! oh no! whatttaaaa success of stalking you foong!!! yayks! been stalking you for months owredi..and it's just now that i made it! so LOL! good enough that you weren't stroke by lightning..
mmmmm..be back here foong..need to finish mah MM..come chop.. I don't see why lightning can't strike the same place/person twice. I mean, the lightning doesn't recognize a place/person right? haha. Dashing to your car.... would be even riskier to be hit by an oncoming car than struck by lightning. About the KL Tower, I think there's prolly a lightning rod or something, which will help to prevent the lightning from going anywhere else. I think... not so sure about that..LOL! I just had the same frightening experience with lightning yesterday evening at Sepang F1 circuit! It was raining heavily and with thunderstorms and I had to walk out in the open to catch my ride back! I could SEE lightning strikes just in front of me. Scary! I read somewhere about a man who got struck by lightning at least 7 times. He must be attracting lightning! Not sure if he's still alive today though. Thanks for the info dude. I'll make it a point to calculate the distance the next time I hear a thunder! Yup. It happens as I read the news before somewhere. Taking photos of lightning? It will be tough -_-"
Foong, I think being struck by lightning is quite like striking being FC here. LOL! That formula about calculating lightning distance is useful. Thanks. I have a friend who lost two tv sets damaged by lightning strikes. I mentioned that earlier in the other post I think. Both were in the same spot. They didn't stay back for the third strike - they emigrated overseas. I can't imagine being struck by lightning and still surviving. For one thing, the air around the point of the lightning strike will rise so quickly that even if you are not directly blasted you'll still be seared by the heat from the expanding air! Scary. u r definitely too free to be calculating how far the lightning is from YOU! but do u know one thing? many ppl tend to put their satelite dish on the highest point of their house? dat is the easiest way for the dish to get strike by lightning.. next time, just place it somewhere open, no need too high, still can get reception, without the higher risk of lightning strike! I agree that Empire State Building is prone to lighting strikes. I was inside looking at their World Guinness Records museum and there was a big hoo-hah saying that King Kong fell down after lightning struck. Those nerds were Japanese of course! I also thought our car is safest coz there's rubber tyres below. No meh? mei teng, I mentioned about that in my post. Go to the link to read more. Ironically, this man survived lightning strikes 7 times but died from suicide! superman, do you mean the place or the person? che-cheh, yeah it's not easy. You need to have some kind of technique right? JL, yeah it's scary. But there are people who miraculously survive lightning strikes! merryn, is it true that the satellite dish always get struck by lightning? The car is safe because the lightning will go over the metallic body of the car and earthed instead of travelling through the insides of the car. You really like lightning, huh? BTW, did you read in the newspaper a father and his son were struck by lightning just a few days ago? it has been raining very very heavily these days, lightings every now and then.. lol..
well it actually depends on the location, i think the empire states building gets struck many times because there's a lightning conductor at the top of the tower? it kinda attracts the electricity.. although the main purpose of the conductor is to drain the electricity from the lightning to the ground..
You're too brave to go outside and attend that appointment thing. I'll probably sleep through the rain, the lightning and thunder so when I wake up, everything would be over! Haha, got a great laugh out of The Curious Case as well. Seems like Roy Sullivan is the one in the movie. I think he was only able to tell his stories 4 or 5 times in the movie. I'm scared of the loud clap of thunder. i seldom go out on rainy days. jam, no I didn't. Guessed I missed the news. But it's not surprising considering how ignorant people are about lightning prevention. monica, you tried? I guess it's not that easy. Wonder how those photographers capture lightning shots. Perhaps this or this will help. neo, I know that. Haha! How about shooting leng lui with lightning in the background? LOL! I'll make it a project to do at least a photo capture of lighting then I'll send you the shot if I get lucky. it doesn't rain much or lightning occurence where i live now. It does strike twice or more at the same place. Gee! What have you got at the back of ur house that attracts lightning? A goldmine? LOL!!! Oh I checked how many times the old man got to tell his story. 6 times! You're right LOL. No, I don't think the man in the movie is playing Roy Sullivan but maybe Mr. Daws' character (man struck by lightning in the movie) is based on him? Here's the deal... avoid being in an open field during thunderstorms. If you're in a place filled with tall buildings or people taller than you then you're lucky, cos they're likely to get struck first, because like everything else, the lightning takes the shortest way down, ie through the tallest/highest building plant. The chances of being strike by lightning twice or more is possible. Lightning usually stike in the same area again and again. A contractor told me that when I checked with him about my house and my neighbour's electricity which tripped too often during thunder storm. wow! This is fascinating! I never knew how to calculate lightening. Need to do it next time we get a storm. There are always some people die because of lightning and thunder in my city every year. i'm not a risk taker. besides, my calculation is poor and i might ended up being fried by the lightning strike. I read before somewhere in an old Malay Reader Digest that there's also a person a local who had been shot by lightning. Funny is that, they mentioned the lightning only kill him on the 7th attacked. Yes I really meant "ATTACKED". off course foong!got two blogs, FCC members-both, so can chop anytime there..do u have twitter lah!?!? u can stalk me there so can chop!!! johnny ong, then I think you better run for shelter instead of counting how far the lightning is from you! Haha! shinky, really? A local "attacked" 7 times by lightning? First time I heard of this! vestige, yes logically, there's no reason why a lightning should not strike the same place twice or more. Wish me luck then! You actually gave me idea, I never had any lightning shot. Seriously, if ever I get to have one, I'll send you. Hahaha :D When I recalled the movie, it was so darn funny! But little did I know that such person is indeed exist! He must be one of the X-men huh! By the way...lady gagay is so into you huh? Muahaha =D Lucky you foong. Thank god i'm short. That means higher chance of other ppl getting strike 1st before the lightning strikes me! ;P lolz! tekkaus, yeah, I was surprised by the existence of such a person! I really thought it's just a joke! If you have FC in your blog, I will stalk you too! Haha! hehehe, as long as it doen't hit me!